Living in the inner west of Sydney leaves me totally spoilt for choice when it comes to Italian restaurants. And thank goodness! I could live on pasta alone for as long as I shall live. Thankfully, so could my two offspring. 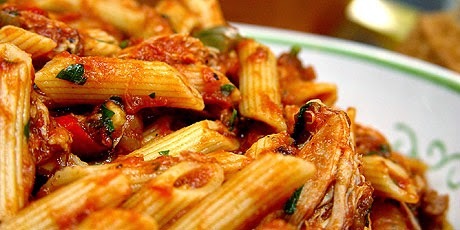 My favourite restaurant meal, therefore, would have to be anything pasta related. Admittedly, I find it so hard to go past the old classic of spaghetti bolognese. But have been known to branch out and try a ragu - this was because I wasn't sure what was in it exactly, my husband told me I was better off not knowing. We do have a favourite local restaurant. Little miss calls it "the one with the silver hair man" because, surprise, surprise it is owned by an older gentleman who has silver hair. Whenever we go there they are so hospitable, there are always cheek kisses and family updates. They seat us at little misses favourite table, right next to the pizza maker, who always spins the dough in the air for her. Little miss and I always seem to order the same dishes when we go there; Penne Siciliana for her and Fettuccine with creamy chicken & sun-dried tomatoes for me. Hubby does mix it up with either pasta, calzone or pizza. Our little man will have something of everything. What is your favourite restaurant meal?